If one looks at a map of Northern Ireland a dominating feature right at the heart of the province is the largest and probably oldest freshwater lake in the British Isles Lough Neagh. Covering 153 sq miles (400 sq km) and touching five of the six counties of Northern Ireland, the Lough currently plays an important part in the commercial, social and sporting life of the people of Northern Ireland. However we have been slow to share this beautiful resource with tourists from outside the province and as such this great lake is potentially one of Ireland's most untapped resources. All this is about to change as the Lough Neagh Partnership, based at Ballyronan; has been tasked with developing important strategic projects on Lough Neagh. The Partnership has been working with statutory bodies, local councils, environmental and special interest groups as well as individuals towards the sustainable development of the Lough. Having opened up the £3.2 million Lough Neagh Strategic Fund in March 2004, the Partnership has engaged with a substantial amount of stakeholders around the Lough and have to date assessed nearly 100 applications from a variety of applicants, ranging from the RSPB to District Councils to local entrepreneurs. As manager Gerry Darby states "People and organisations around the Lough have enthusiastically taken advantage of the new development resource that is now available. 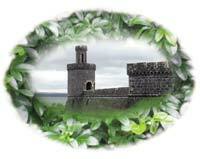 Through working in partnership with all of the stakeholders, I believe we will soon see considerable positive changes beginning to happen on the Lough"
At the same time as the Partnership was being launched an important event was being launched at the historical landmark loughshore site of Shanes Castle - the 2004 Country Lifestyle Festival. In what was just its second year the Festival's unrivalled programme of Countrysports, Country Lifestyle, Medieval and Equestrian attractions drew a huge crowd and the event without doubt became N. Ireland's leading countryside event. Its success was recognised by the event winning the NITB bmi Marketing Excellence award. With the success of the 2004 event behind them the Festival team thought it appropriate to take a lead role in helping promote the tourism, sporting and commercial potential of Lough Neagh but in an environmentally sensitive fashion that is cognisant of the great history and traditions of the lough and its people, by becoming the lead Festival of Lough Neagh. The Lough Neagh Partnership welcomed the involvement of what in effect was a "ready made" lead Festival for what should be a series of Festivals around the Lough. Gerry Darby said "The Lough Neagh Partnership has committed funding to the development of the Country Lifestyle and Lough Neagh Festival 2005. As can be seen from the list of projects sponsored, the Lough Neagh Partnership has overseen and managed a significant amount of European investment into the Lough and the Festival will provide another added attraction which will promote and highlight the importance of the Lough as a major visitor attraction." Like most large lakes and loughs, Lough Neagh has many myths and legends surrounding both its origin and places around its shores. Myth has it that the Ulster Giant Finn McCool picked up a clod of earth and threw it at a rival across the Irish Sea, thus creating Lough Neagh and the Isle of Man. There are many other legends surrounding the lough, Shanes Castle and Antrim including that of the Antrim wolfhound - Carved in stone in 1612 - it is reputed to have saved Lady Marion Clotworthy from a wolf and the Castle from a surprise attack from enemy forces. It is from these two legends that the Festival draws its imagery for the launch of a Festival of the Lough that will not only look back to ensure the preservation and celebration of the rich history and heritage of the lough but also help point the direction forward to what should be a glorious future. 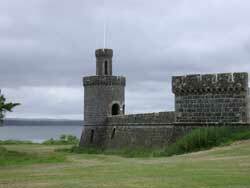 Shanes Castle is probably one of the most recognisable landmarks on the lough and shares with the lough a rich history of myths and legends . 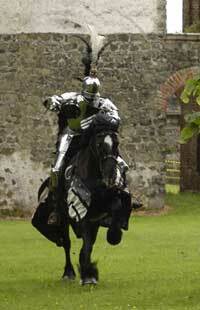 The Castle lies on the shores of Lough Neagh, and at the very heart of Northern Ireland. The Estate is the home of the O'Neill's , the oldest traceable family in Europe. The O'Neill family was one of the great Royal Houses of Ireland and through many generations the family has been linked with the history of the lough and indeed the whole province of Ulster The present Lord O'Neill still lives on the estate which is recognised as a very fine example of how farming, countrysports and conservation can work together for the preservation of the countryside.. Although the Old Castle was destroyed by fire in 1816, the ruins are still extremely atmospheric and have much to interest the visitor including the towers, castellated terraces ( with rows of cannon retrieved from the wreck of an 18th Century man-o-war ), and the camellia house ( designed by John Nash and still producing blooms from 100 year old plants). Shanes Castle too has its ghosts including a fire razing banshee and its legends including the Black Head of the O'Neills. This is reputed to hold control of the destiny of the O'Neills from its lofty position on the east tower. With such a history than can surely be no finer location for the medieval village, with its knights and chargers, falconers, long bowmen, minstrels, and craftsmen, based in the castle over the time of the Festival ( see www.irishmedievalfestival.com ). Equally the estate's impeccable conservation, farming and countrysports traditions and Lough's tradition of wildfowling and fishing, make Shanes Castle an obvious location for a major countryside event. Also with its landmark and historical site on Lough Neagh there is also no finer location to host the Lough Neagh Festival. 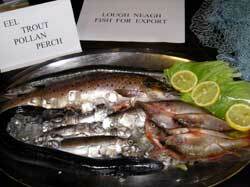 As the largest lake in the British Isles, Lough Neagh has always been synonymous with fishing and shooting. The rivers flowing into the Lough and the small lakes surrounding it offer fine fishing. Eels,salmon, pollen, perch, bream, roach and dollaghan (Lough Neagh Trout) are among the species to be found and provide a range of challenges to all sorts of anglers. It was felt appropriate to launch a NI Angling Show as part of the Lough Neagh Festival. The lough is also home to a number of wildfowling clubs who not only harvest a bounty from the large number of wildfowl that winter on the lough but also like the award winning Three Islands Gun Club put a great deal back with conservation schemes ( including litter clearance and planting); vermin control and rearing programmes. Wildfowling will be represented at the Festival by a display by BASC and by the Irish Water Spaniel Club ( the traditional Lough Neagh wildfowling dog). The Country Lifestyle Festival organizers are delighted to be able to play a role in the development of this fantastically under exploited Northern Irish resource. Albert Titterington, Director of the Festival said " My colleagues in the Irish Country Lifestyle Festival created a really spectacular show in 2004 which was rewarded by the Festival being awarded the prestigious Northern Ireland Tourism Marketing excellence award. With Shanes Castle occupying a landmark site on the lough, I was delighted to acquire the support of the Lough Neagh Partnership Fund, the Northern Ireland Events company and the NITB to launch a lough based Festival in conjunction with the lifestyle show. With the partnership funding massive improvements in the Lough, we are delighted to play our role in ensuring that the development will take place in an environmentally sensitive fashion that looks after the interests of countrysports people as well as commercial and of course conservation interests. We are also delighted to have secured the support from most of the Council areas around the lough and in future years this will develop further, with not only individual council tourism, crafts and fine food displays but also inter council competitions and projects. Apart from a regatta, organised by Antrim Boat Club and a spectacular simulated rescue by Lough Neagh Rescue, in future years the Lough will feature prominently in the overall Festival with a number of additional water based activities. In an attempt to showcase the current commercial, craft and tourism activity around the Lough and to help stimulate future activity in these areas a number of Lough Neagh Pavilions will take pride of place in the tented village. Many of the lough's delicacies including smoked eels will take pride of place in the Fine Food and Drinks Pavilion; craftsmen and women from around the lough will display their wares in a Lough Neagh Country Crafts Pavilion and Countryside Alliance Ireland will mount a major Lough Neagh Conservation and Countrysports Pavilion which will feature a wildfowling exhibit by BASC." The Lough's association with fishing will also be highlighted with the launch of a specialist Northern Ireland Angling Show featuring the NI Fly Tying Championships, a fantastic range of tackle, sporting holidays and fisheries, clothing, boats, boat building and coaching and displays from Ireland's top fly casters.